Pre-orders are now available for Game of Thrones™: Oathbreaker! Will you claim the Iron Throne as King? Defend the realm as a Loyalist? Or throw the Seven Kingdoms into chaos as a traitorous Conspirator? Whatever your path, you will win or die based on your ability to tell enemies from allies while concealing your own ambitions. 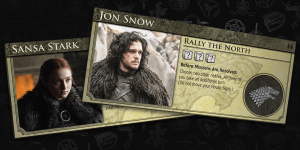 And, as an added bonus, when you pre-order Game of Thrones™: Oathbreaker, you’ll also receive the Jon Snow & Sansa Stark double-sided promo character board! Throughout a game of Oathbreaker, players will amass Coin, Power, and Honor reward cubes based upon their participation in various missions throughout the Seven Kingdoms. Loyalists and Conspirators both want these rewards, but what they do with them along the way can help you decipher their true intentions. Each player in Oathbreaker has a unique character power that allows them to spend their hard-won reward cubes for an immediate effect. Activating these abilities sets them further back from achieving their ambition of winning the game, but can provide a powerful short-term advantage. To understand your opponents’ motivations, you need to know what they’re capable of. So let’s take a look at just a few of the 12 playable characters that you might find yourself facing around the Small Council table. The Lord of Winterfell and reluctant Hand of the King, Ned Stark has powerful allies… but only if he can figure out who to trust. By spending two reward cubes, Ned can “Call the Banners” to have another noble of his choice either let Ned draw three cards… or increase Chaos in the realm, speeding the downfall of the King! But… what if Ned himself is a Conspirator? Intentionally choosing another Conspirator might cost Ned cards, but increases Chaos (which they both want) while also causing the King to doubt who is truly loyal. There are many ways to scheme in Oathbreaker, and what seems like honest failure can sometimes mask a traitorous success. The Imp of Casterly Rock is as cunning as they come, and a hardened survivor of more schemes than you can slosh a wine goblet at. His signature power in Oathbreaker, “I Drink and I Know Things” puts his insight to the test. If Tyrion’s player can correctly guess the outcome of his mission, he’ll have more cards at his disposal than anyone else for the rest of the game. 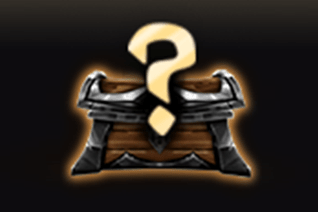 To correctly guess, Tyrion’s player will have to keep a close eye on the other nobles, and make canny guesses about who wants what. The power of the Marriage Pact rests in Margaery’s player’s ability to make a good match: If Margaery is a Loyalist, giving such a boon to another Loyalist can help propel the King to victory. But if Margaery is a Conspirator, much more subtlety is required: she’ll want to choose a spouse who the King does not suspect of treason, lest she fall under suspicion herself. Melisandre’s “Gaze Into the Flames” power lets her shape destiny by removing a card from her mission — before anyone else gets to see what’s there — and putting it in her hand. Sometimes, this move will be able to change failure to success — or vice versa — causing great Order or Chaos in the realm. When that’s not the case, Melisandre’s player simply gets to help herself to the best card played to that mission, while discarding the worst card in her hand. Jon’s ability to “Rally the North” allows his player and two allies to act twice in a round, potentially swinging the balance of power… if Jon’s player chooses wisely in who they trust! Three players – Loyalists or Conspirators – acting in concert can be a huge advantage for their side, but choosing wrong can lead to disaster. Will you be great? Pre-order now and play Game of Thrones™: Oathbreaker!